I will go before you and level the exalted places, I will break in pieces the doors of bronze and cut through the bars of iron, I will give you the treasures of darkness, riches stored in secret places, that you may know that it is I, the Lord, the God of Israel, who call you by your name. Without fail, whenever I have a question and answer time after I speak, someone asks, “How did people practically help you after the death of your son?” I always refer them to Chapter 11 in Treasures of Encouragement. I recognize the feelings of inadequacy in the question. People want to help hurting friends, but often just do not know how. 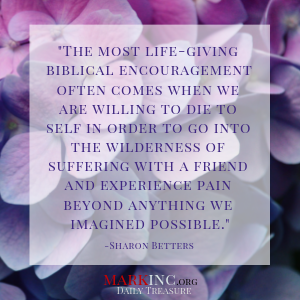 Practical lists are helpful, and I include many in my book, but the most life-giving biblical encouragement often comes when we are willing to die to self in order to go into the wilderness of suffering with a friend and experience pain beyond anything we imagined possible. “A phone call in the middle of the night started me on a journey I did not want to take. Adrenaline pumped my body into action as I threw on my clothes, resisting what I could not avoid or deny. Rushing out the door, I pleaded with my husband, ‘Tell me what to say! I don’t know how to help her! You have to tell me what to say!’ But he couldn’t. He could only promise to pray that God would answer my plea. Sobbing and yelling my disbelief to God as I raced to the hospital, I fought two conflicting desires – to be with my sister because she needed me and to stay away because there was nothing I could do to help her. I couldn’t even pray for healing – her son was dead – taken away instantly in a car accident. “Over the next weeks, months, and years as I went to her home, I felt as if I was stepping into another world – a world where pain ruled and darkness shadowed every bit of life. Even two years later, on the anniversary of that awful night, I felt the familiar dread. Driving to her house with tears streaming down my face, I sobbed, why am I going? I can’t do anything to change what has happened and it hurts just to be there. But I went. Many times I went. I listened. I cried. And I prayed, begging God for mercy. “What happened when I stepped into my sister’s pain was change – change in me. In that home filled with grief was the presence of the Provider, the Comforter, and the God of Peace. Pain often prevented Sharon from realizing His presence, but I could see the clear path He was making through her suffering. As she shared her broken heart with me, I also received the treasures He was giving to her. Watching Him work shaped and strengthened my faith. She was so weak that His strength barely sustained her, but from my position, it was awesome and marvelous. We were on holy ground in this journey. God would do His part in the healing process, and I had a front-row seat. He might even use me in that process. I felt honored to help bear the heaviness of her burden. I was learning so much about death and life. I would never be the same. “Was I adequate for the task of ministering to her? Definitely not! Time and time again I felt totally incapable of dealing with her needs. Though most of the time, I believe I was asking more of myself that she was expecting of me. All she wanted was my love and my presence alongside her in her journey through the darkness. That usually meant just listening to what she was feeling and thinking. But just listening was excruciating, and not having answers was maddening. Is God calling you into the darkness with a broken friend? There are treasures waiting for you when you die to self and go in His strength. Have you noticed that when God calls us to certain actions, treasures and blessings follow obedience? In a previous devotional we saw that God’s call to pray without ceasing leads us to deeper intimacy with Jesus as we grow more dependent on Him. When we obey His call to weep with those who weep and go into the darkness with a friend, we discover treasures in that darkness that we would not have experienced otherwise. Is God calling you to offer deeper life-giving encouragement to a shattered friend or family member? Remember the power of prayer to guide you and teach you how to lean into the wisdom of Jesus as you go into a place that may be foreign to you. If God calls, He equips. Trust Him to guide you as you go. Oh Lord, how grateful I am for those who traveled into the darkness with me. I pray that someone reading this will recognize Your call to go into the darkness with a friend who is hanging on to life by her fingernails. May that person reflect the help and hope that only Jesus offers.